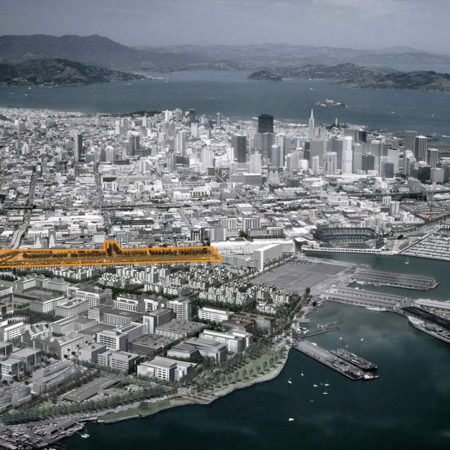 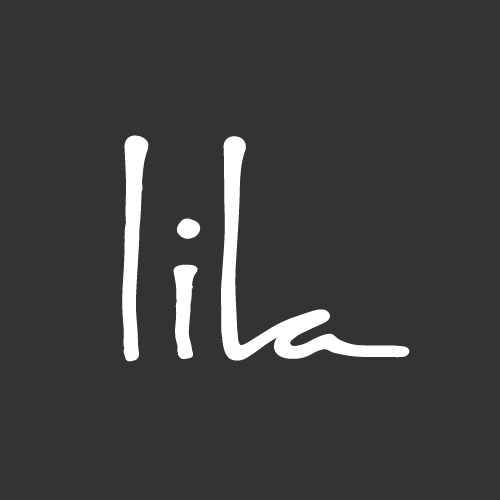 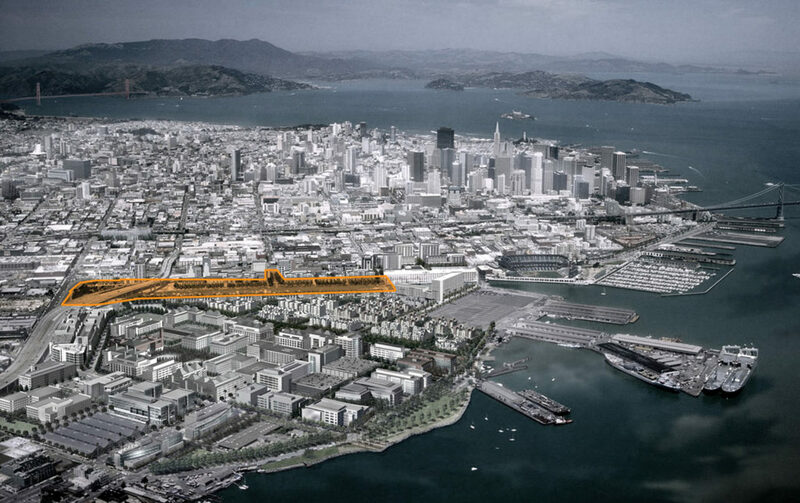 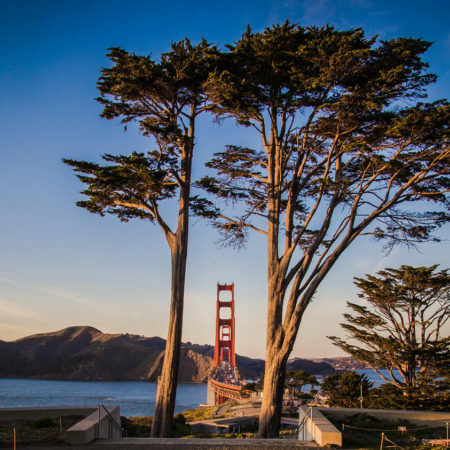 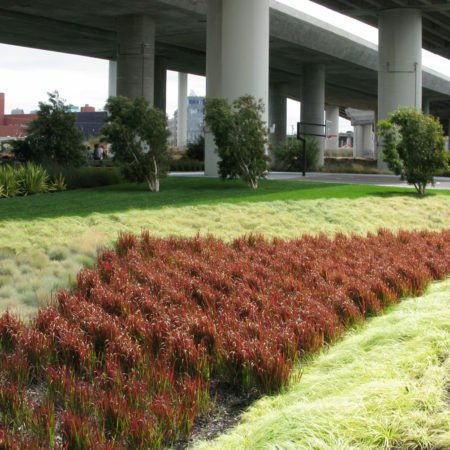 MFLA [Marta Fry Landscape Associates] is a San Francisco-based urban design and landscape architecture studio, established in 1990. 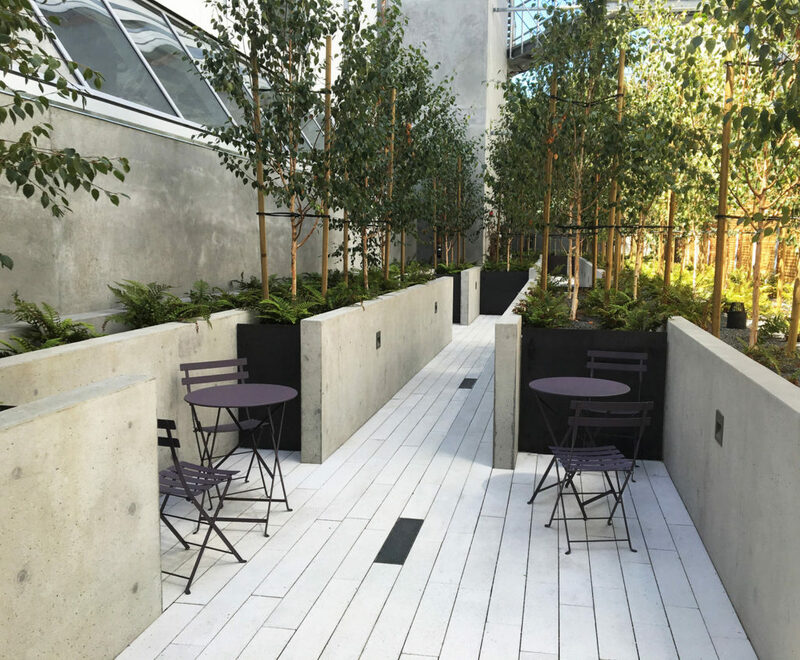 Structured in an atelier fashion, the Studio finds collaboration and the design team interface critical to every project’s success and emphasizes a site-specific response to each project, regardless of scale. 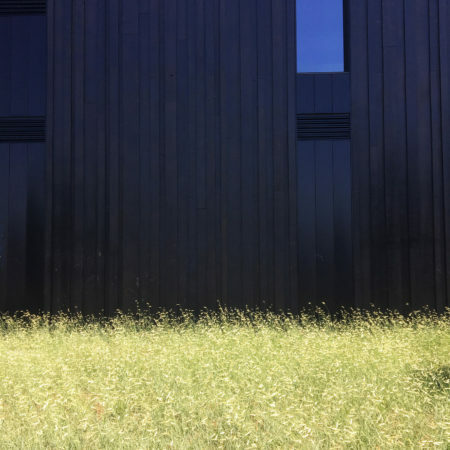 The Studio’s commissions comprise a diverse portfolio, one which intentionally blurs the boundaries between design disciplines and highlights the role of the landscape architect in the built environment. 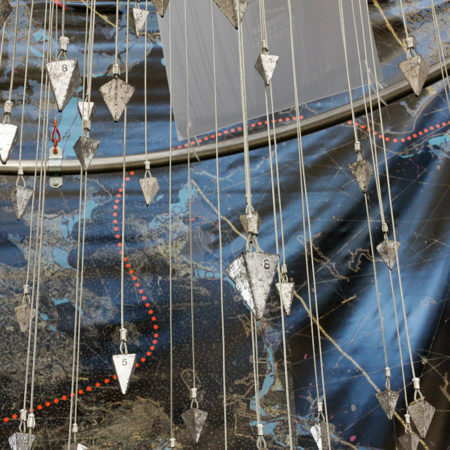 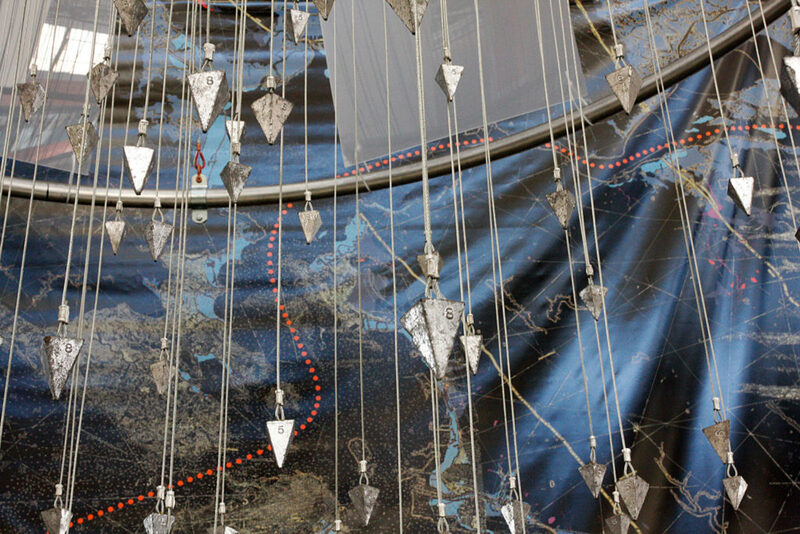 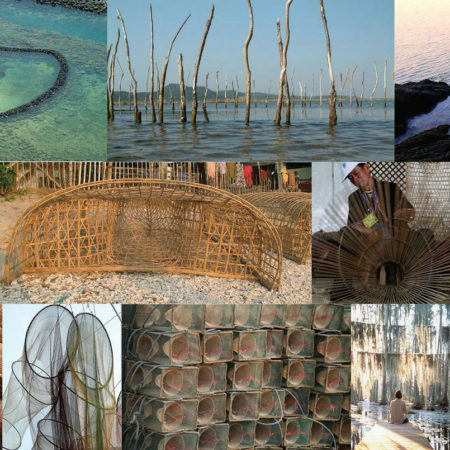 Believing that the landscape is one of the most potent and lasting forms of cultural expression, MFLA explores the intersections and complex relationships between the environmental, social and cultural systems present in every project. 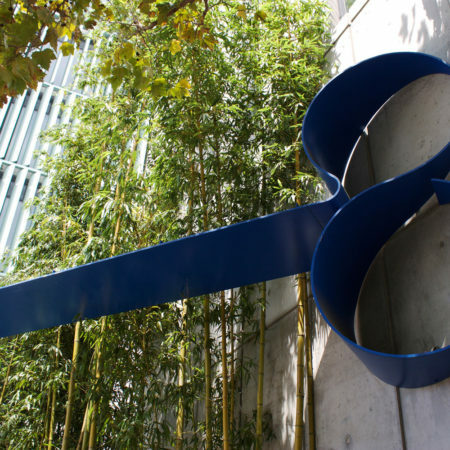 The Studio aims to reveal and express these dynamic relationships in forms and compositions that enable vital understandings and reconnections to place. 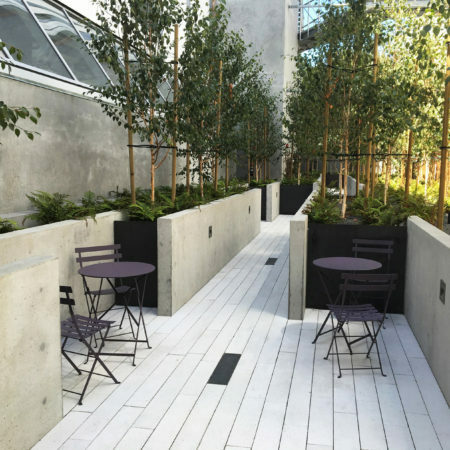 Enduring, sustainable, and compelling environments are the result of the creation of places that resonate with their context, create value through experience, and that establish an unmistakable level of quality through a classic yet minimalist design language. 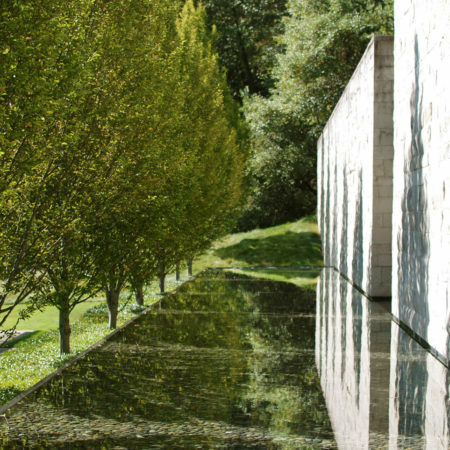 Central to this philosophy is the focus on the creation of places that are authentic, engaging and embedded with memory. 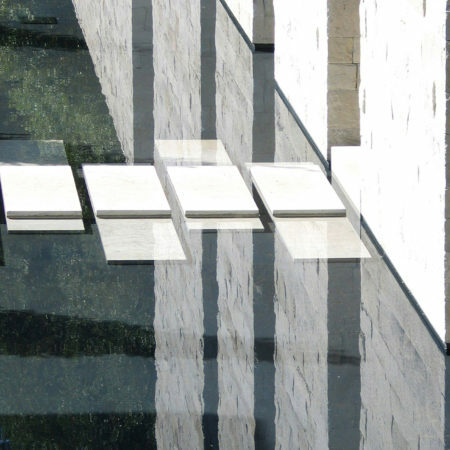 MFLA also understands the living nature of each project, and so incorporates a design framework that will only flourish with time. 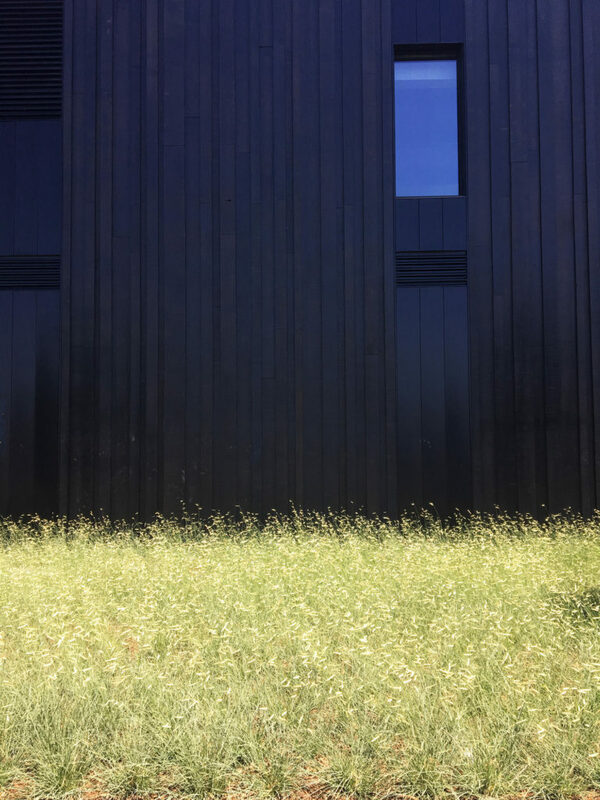 Influenced by California’s natural beauty, textile design, and her travels around the world, Marta Fry incorporates her vast knowledge of materials, textures, and horticulture into the Studio’s work to create sustainable and identifiable environments. 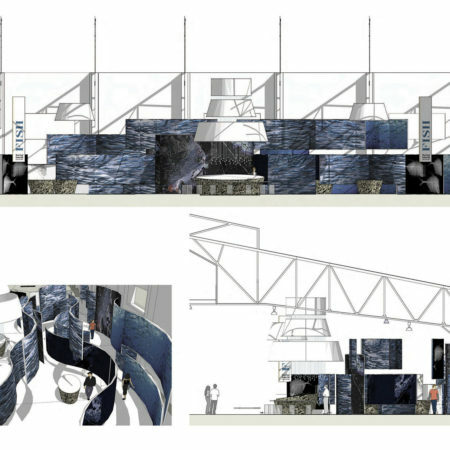 This weaves into the Studio’s intersection with other fields including architecture, art, planning, and cultural history, an exchange that becomes vital to the Studio’s design process. 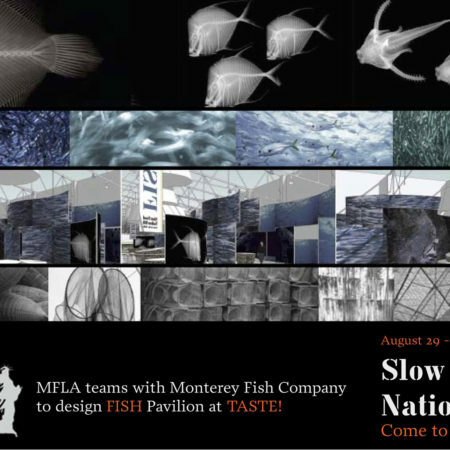 As a small Studio, MFLA functions as a cohesive design team that directly interfaces with each client group. 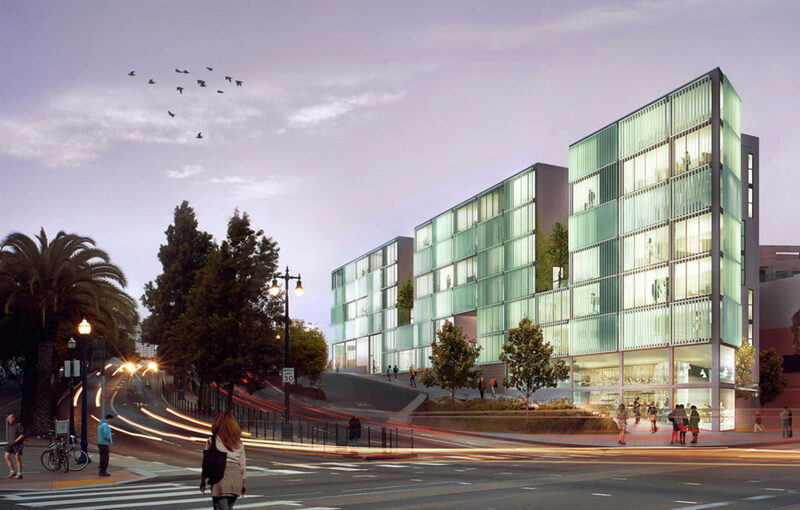 Grounded in the design and technical skills necessary for each project, the Studio team brings diverse perspectives to their work and a deep knowledge of the San Francisco Bay Area, as well as other regional and international environments. 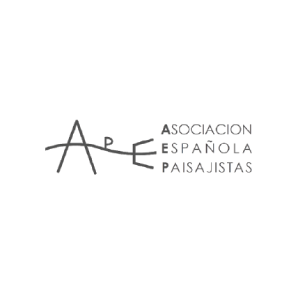 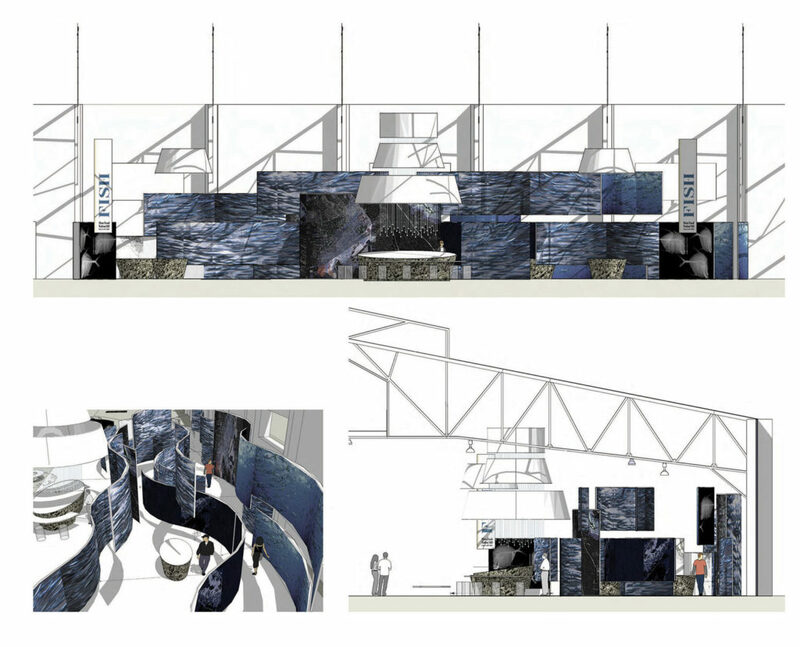 Altogether, the team’s internal collaboration and connection to their surrounding area engages each project on a distinct, personal, and cultural level. 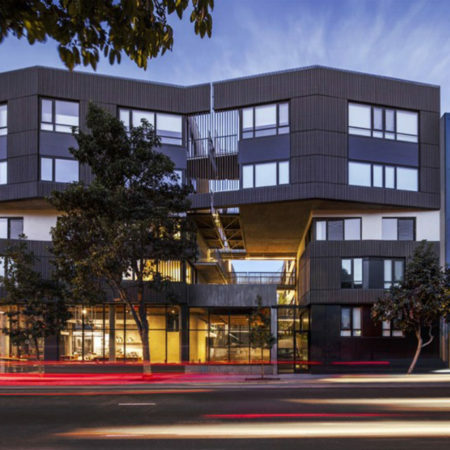 Located in San Francisco’s Mission District, the Studio engages in both the design and public life of the Bay Area, while also finding inspiration and engagement abroad. 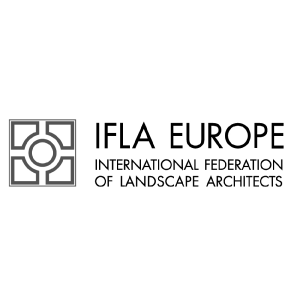 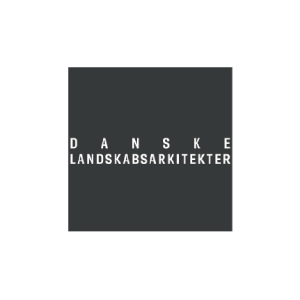 MFLA has recently opened a second studio in Sweden and looks forward to embarking on new collaborations and projects in the Scandinavian design realm. 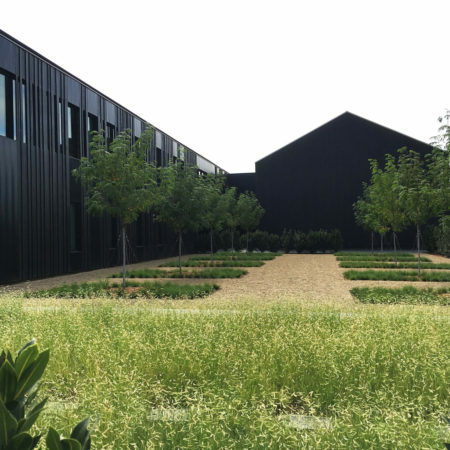 MFLA’s broad scope of project types reflects the Studio’s variety of interests and its purposeful blend of environments that reframes the landscape. 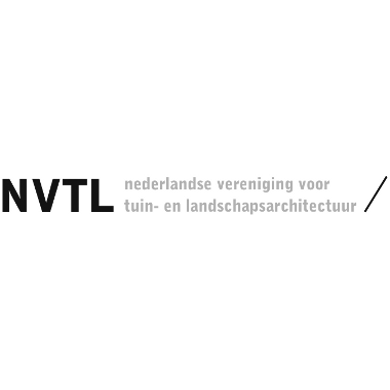 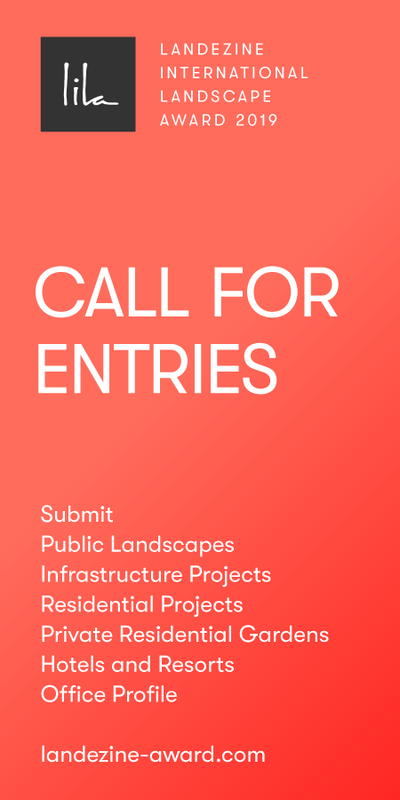 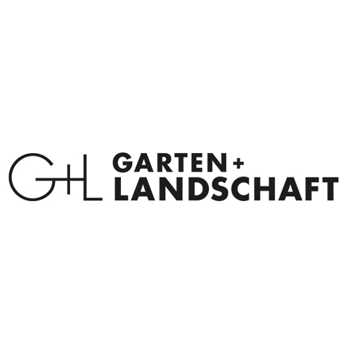 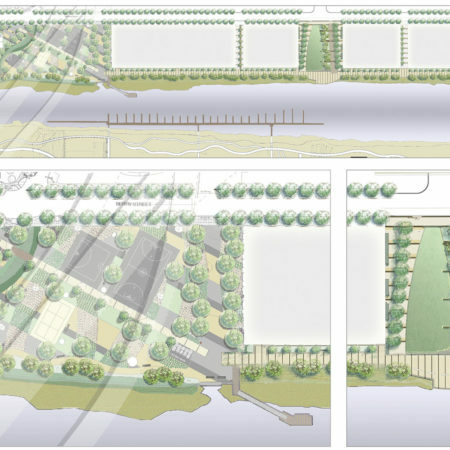 Projects include land-use and master planning, cultural landscapes, parks and streetscapes, product branding, residential estates, multi-use commercial and residential developments, agricultural properties, resort and hospitality and campuses and civic landscapes. 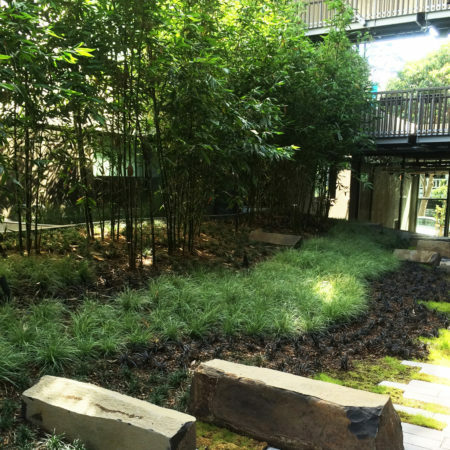 In each of these projects, MFLA maintains a design approach that creates landscapes of presence, spatial choreography, and dramatic settings, inviting active and passive participation in the landscape environment. 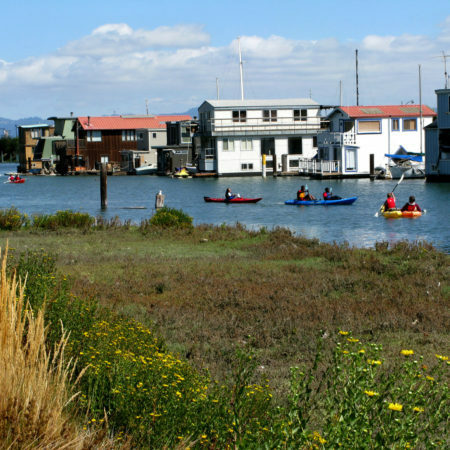 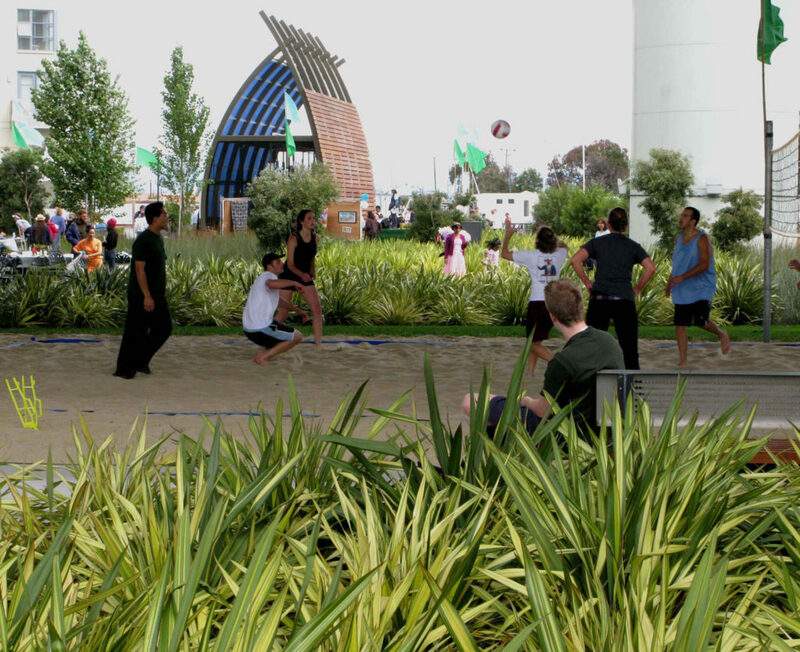 Mission Creek Park North is one of the first public parks developed within Mission Bay’s 49-acre system of open space. 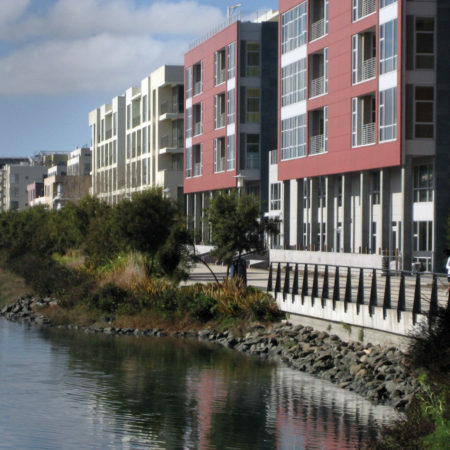 Framed by mid-rise and tower residential developments, Mission Creek, and a thriving, eclectic house boat community, this park creates both a physical and visual link between San Francisco’s existing urban fabric and unique waterfront environment. 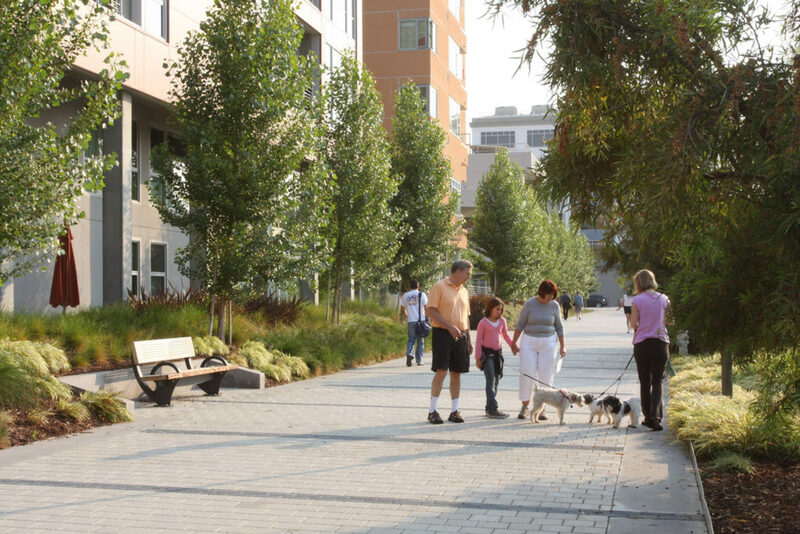 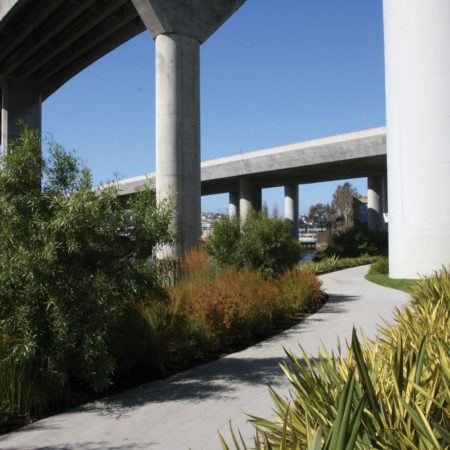 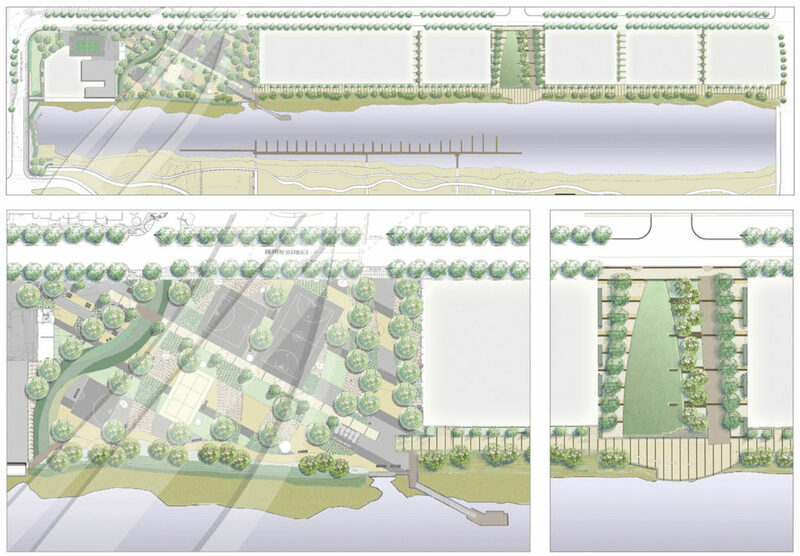 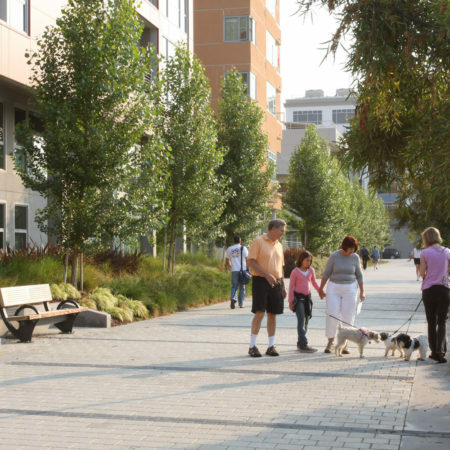 MFLA developed a linear park with a series of plazas, a generous 20’ esplanade that follows the length of the Mission Creek Channel, and the Sports Park which was developed underneath the existing I-280 freeway ramp. 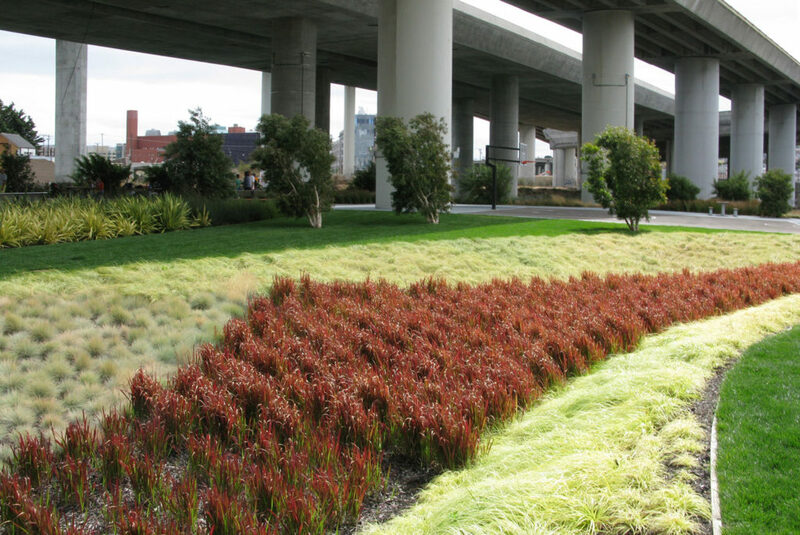 Formerly a low-lying industrial brownfield where frequent flooding occurred, the park was designed as a primary defense in intercepting, filtering and reducing stormwater flows through a series of weirs, cobble fields, and overland flow channels. 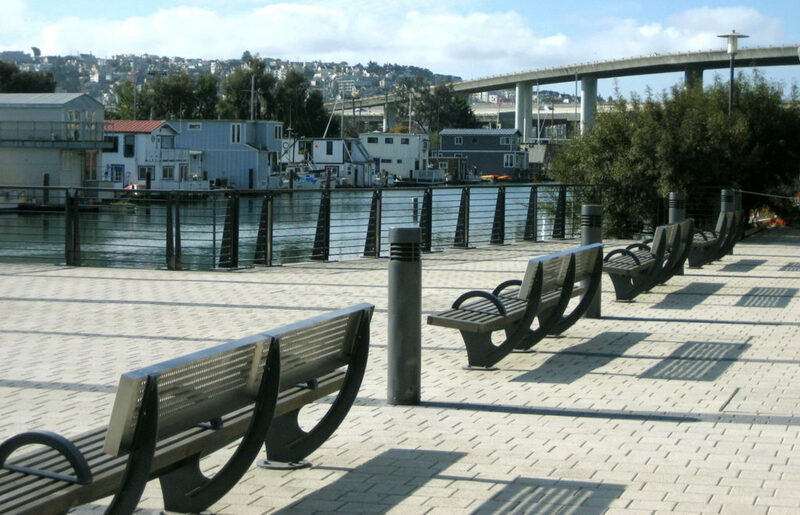 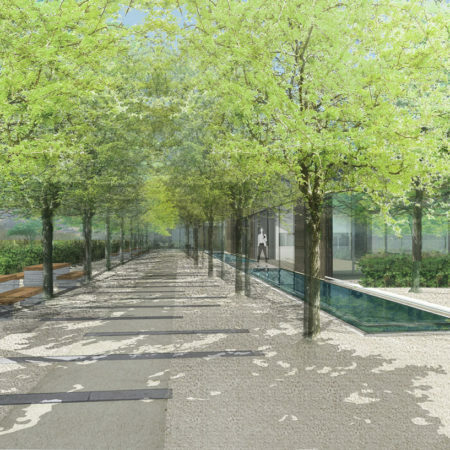 Deferential settlement was designed with pile supported structures and hinge slabs and a flexible paving system to allow for settlement and ease in stormwater mitigation. 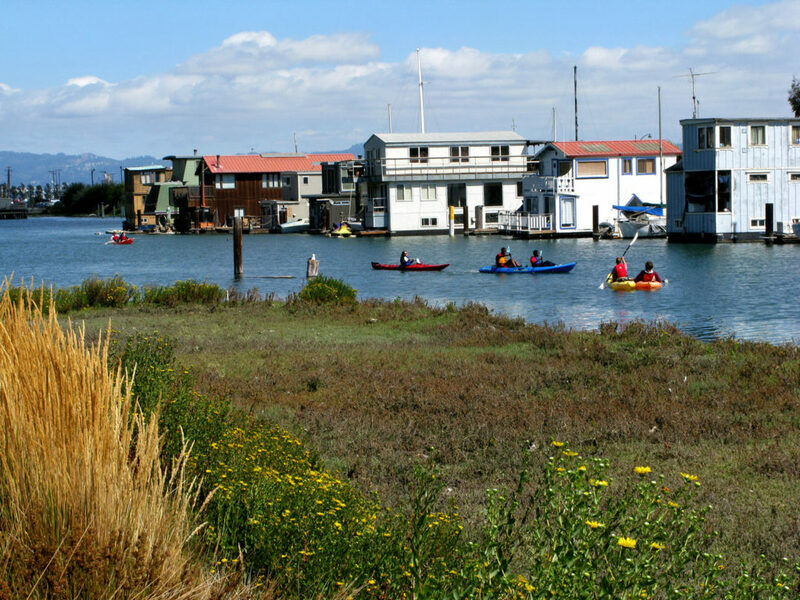 The park’s estuarine banks, once urban dumping grounds, have been reengineered and stabilized with wetland plantings and are now a thriving habitat for waterfowl. 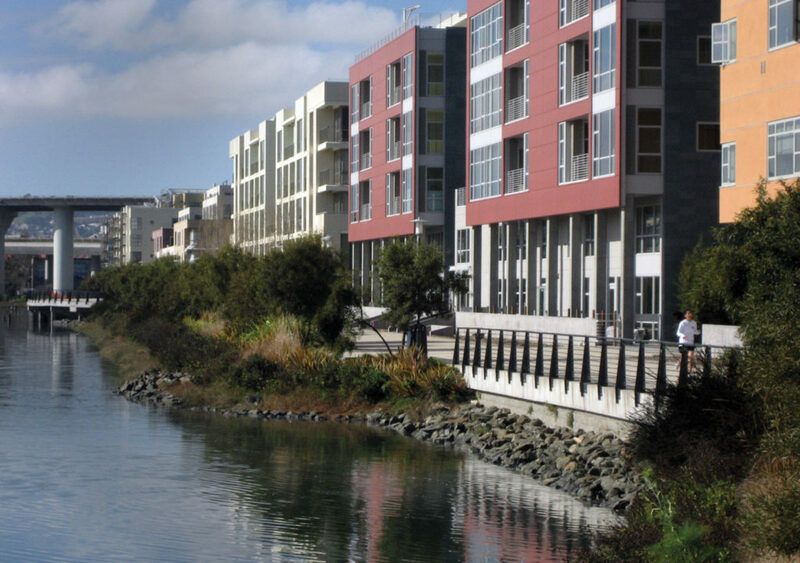 The park represents a decade of community outreach, planning and phased implementation, and is now home to the diverse Mission Bay community. 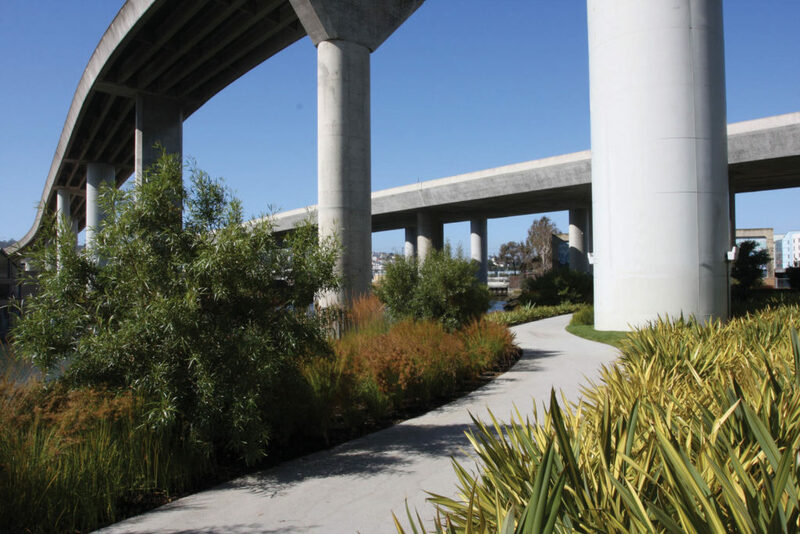 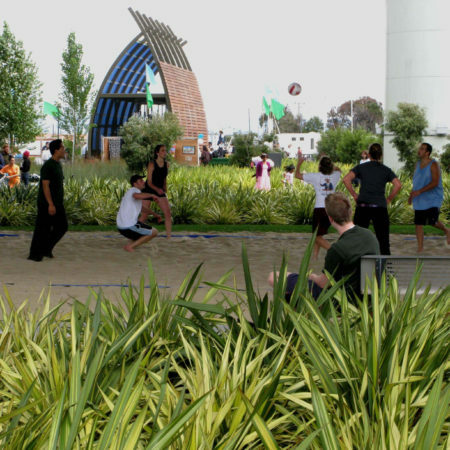 This park is part of MFLA’s larger masterplan for Mission Bay’s open space and streetscapes, a total of 49 acres. 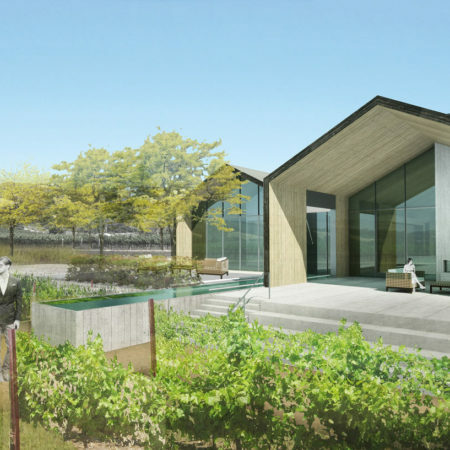 Nestled at the base of Sonoma Mountain, this 160-acre residential vineyard site marks a ten-year collaboration of site evaluation, master planning, vineyard and cider orchard planting, and ancillary structure development. A strong agricultural vocabulary was developed relying on the repetitious potency of patterned windrows, hedgerows, vineyards, and orchard grids. 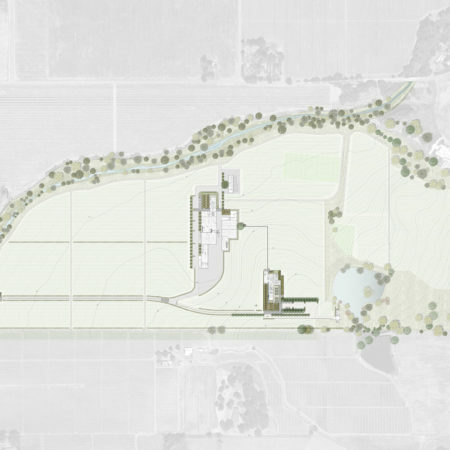 The project represents an assemblage of buildings within a carefully modulated landscape, a modem villa framed in an agrarian setting. 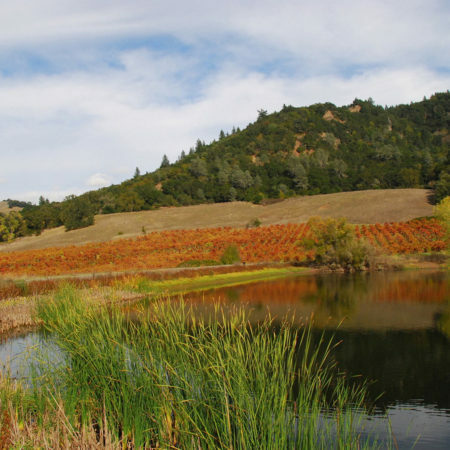 Vineyard layouts and agricultural requirements greatly informed MFLA’s master plan with agricultural patterning taking precedent. 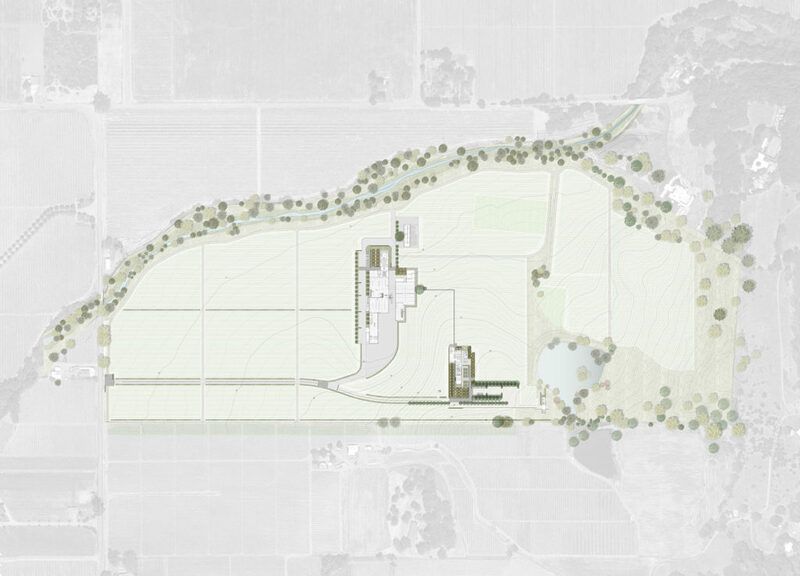 The owners’ interest in cartography influenced the Main House siting and other site elements reflecting in a true north-south orientation, with windrows further reinforcing this axis. 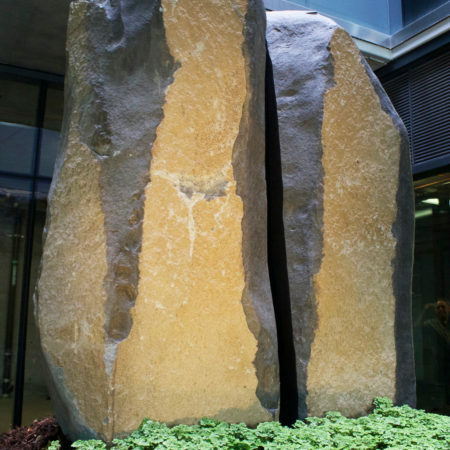 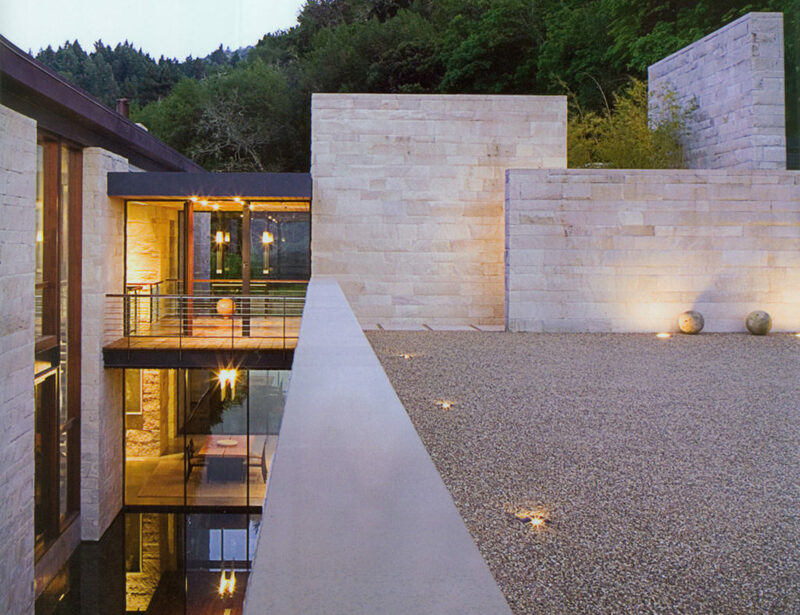 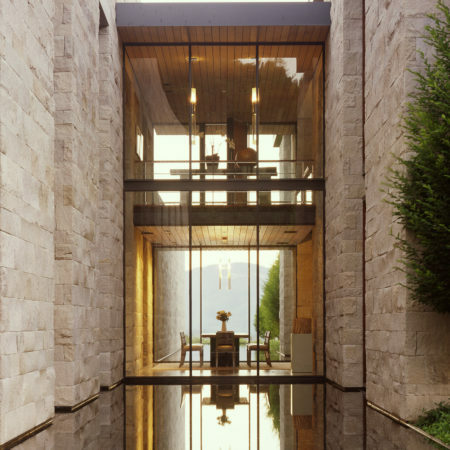 A quiet palette of limestone, quartzite, cor-ten steel, ipe, glass, sandstone, concrete and stone gravels form the building blocks of the structures and site. 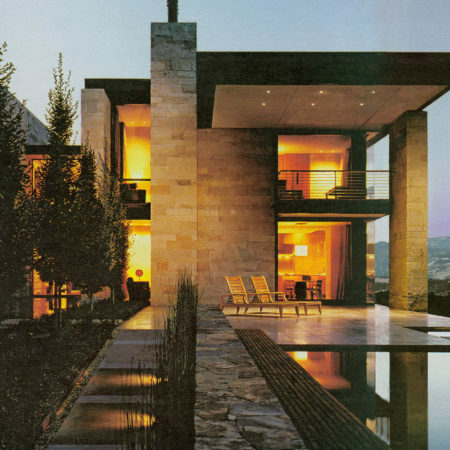 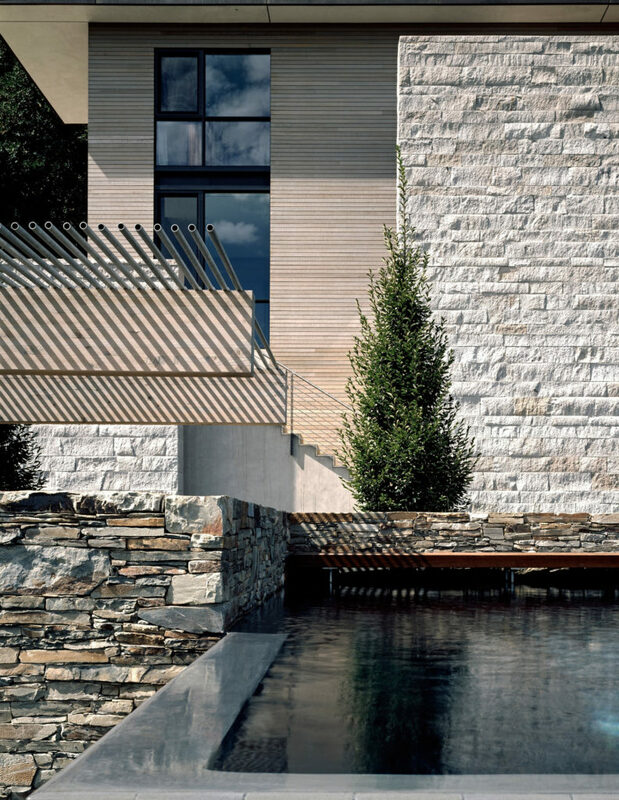 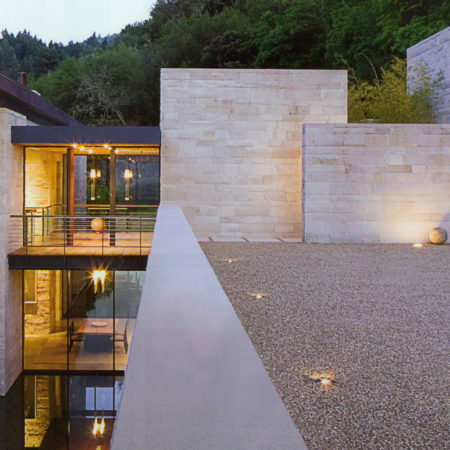 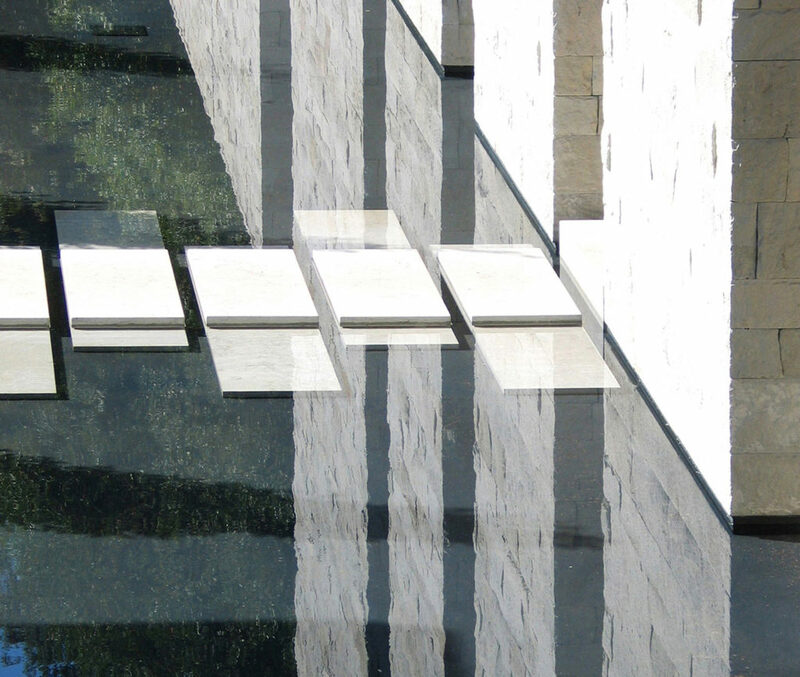 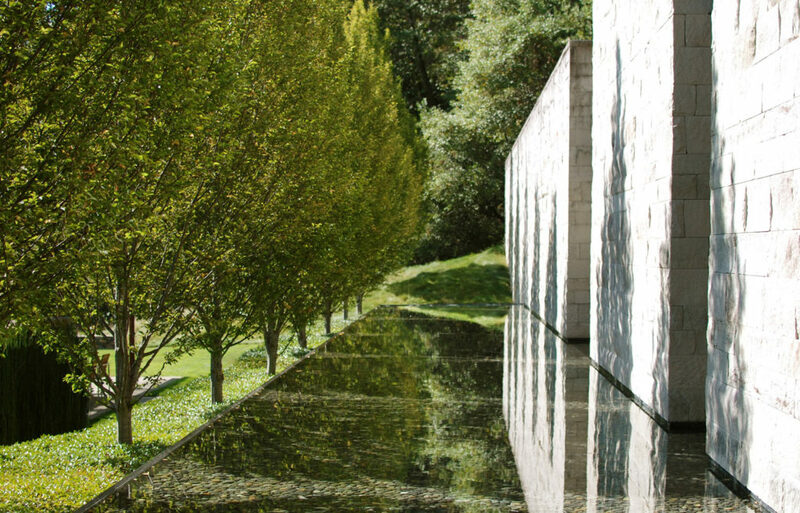 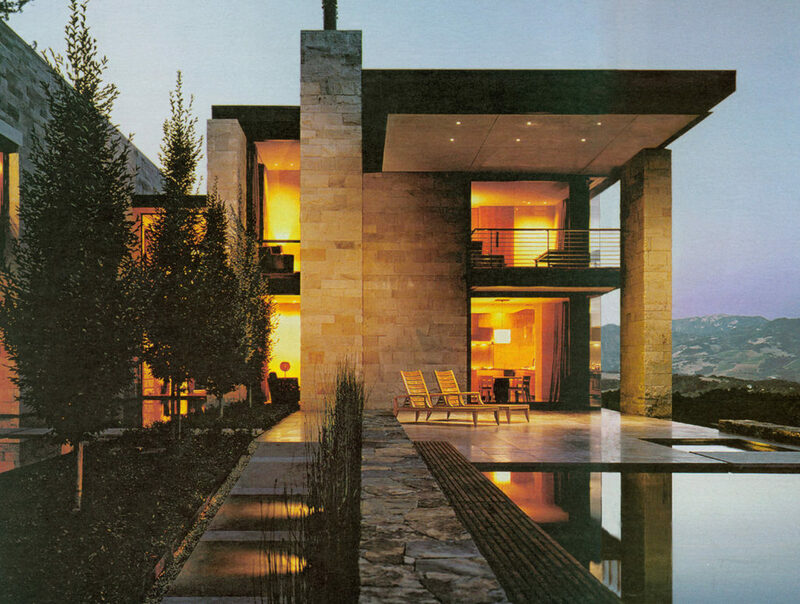 A rectilinear reflecting pool slides along the entire length of the house. 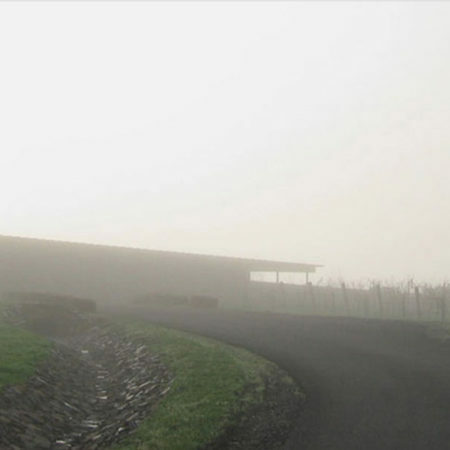 The vineyards then meet the edge of the house, pushing the boundaries of the agricultural landscape, and further strengthening the relationship between the built and the land. 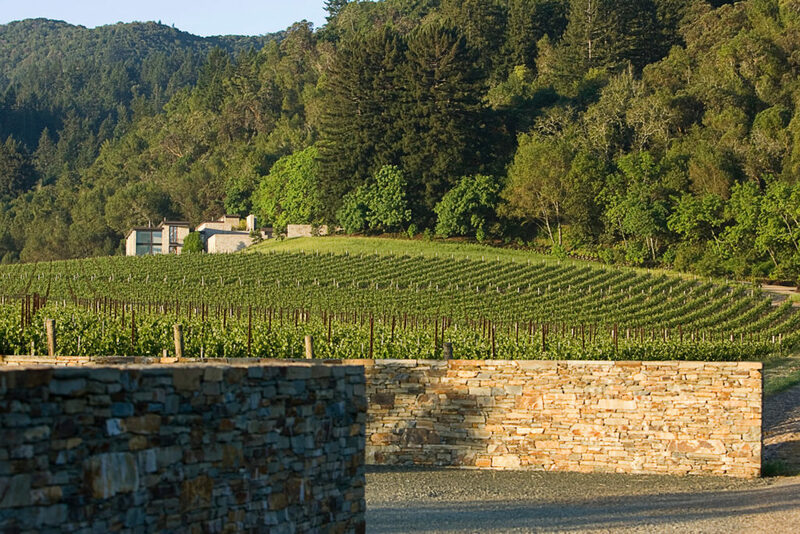 The Sonoma Vineyard is a project in which agricultural acumen combined with a strong horticultural expertise, and great attention to detail and craft, resulted in a minimal, agriculturally rooted assemblage. 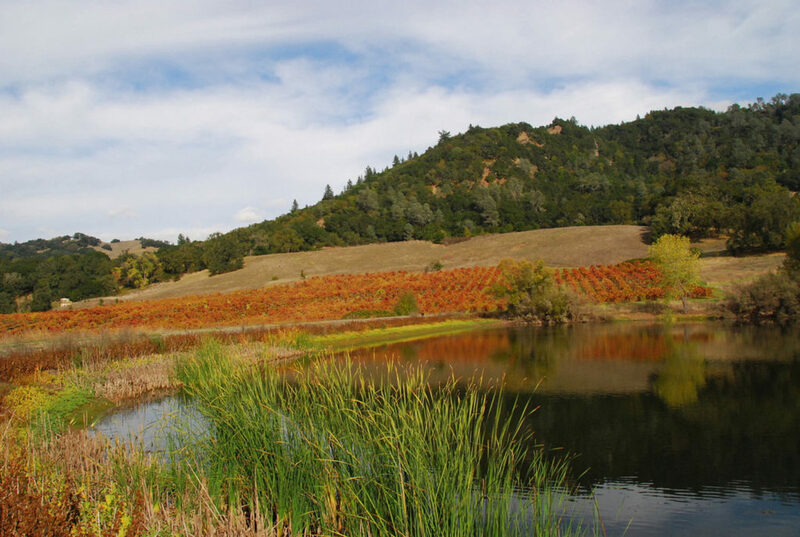 Situated at the base of the Alexander Valley foothills, the Silver Oak Winery site has been home to vineyards since the early 1880s. 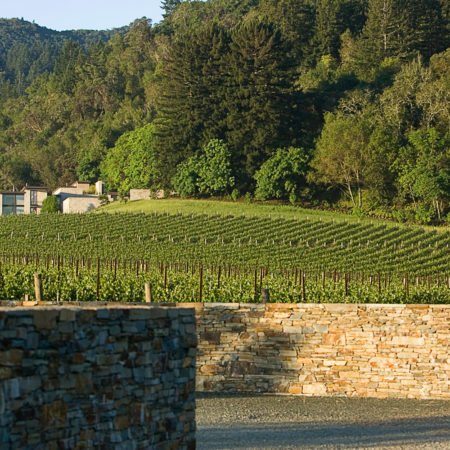 Well-known in the region for their rich Cabernets, Silver Oak Winery intends to be a leader in sustainable viticulture and to demonstrate a transparent and educational experience for its visitors. 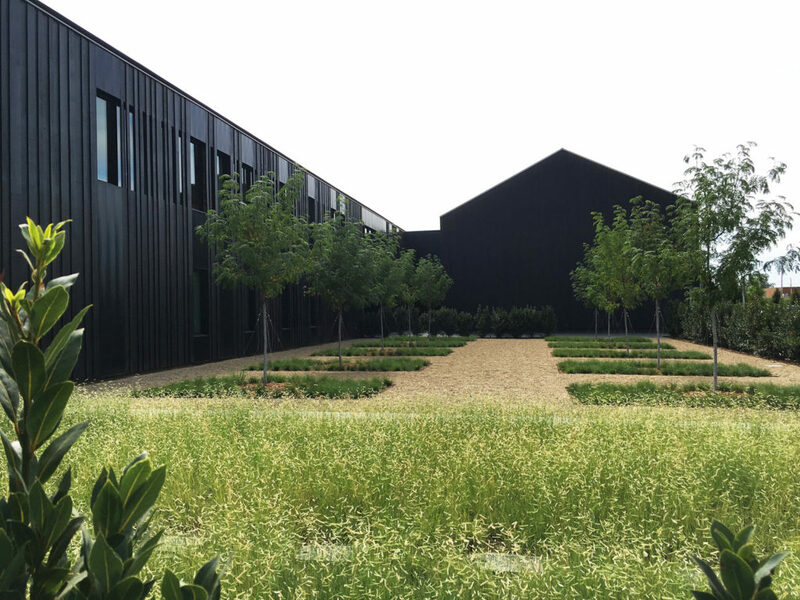 The landscape design of their Alexander Valley location incorporates an agricultural setting with hedgerows, bosques and allees to define both the production and hospitality environments at Silver Oak. 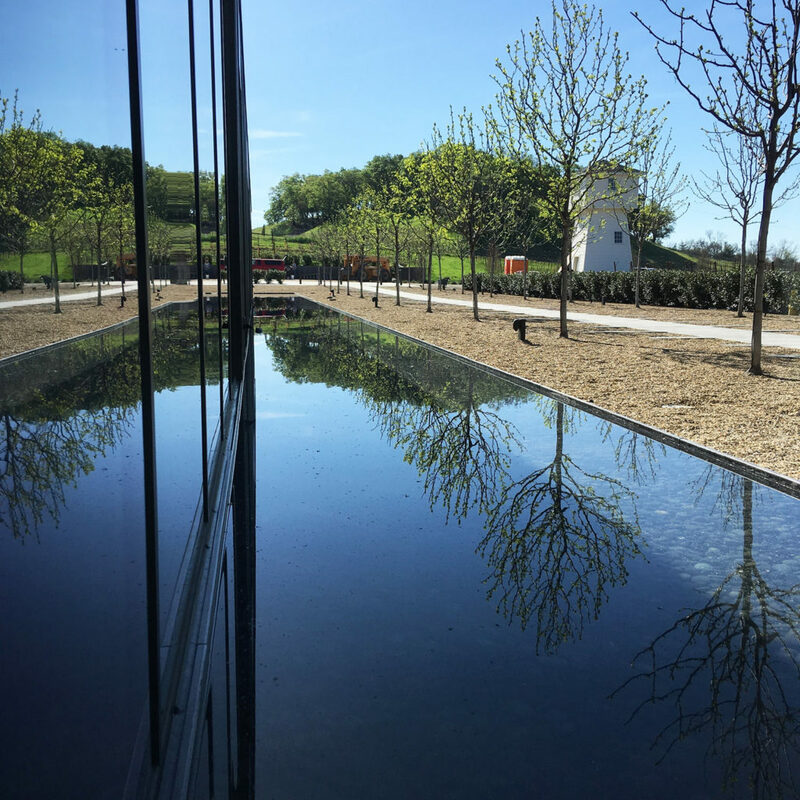 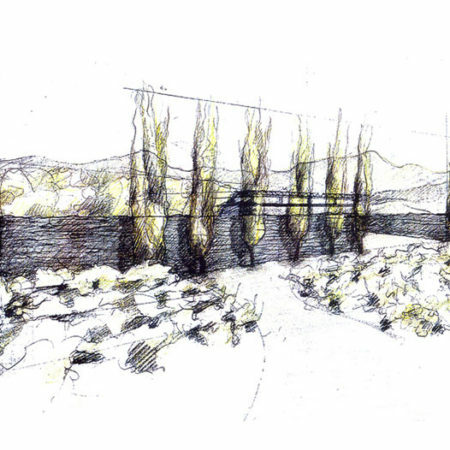 As part of a working winery and visitor destination, the planting design calms traffic and helps navigate the visitor through the winery with hedge baffles and bioswale planting along the entry road and important vehicular junctions. 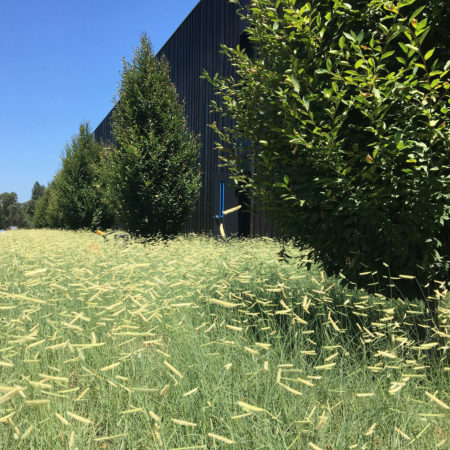 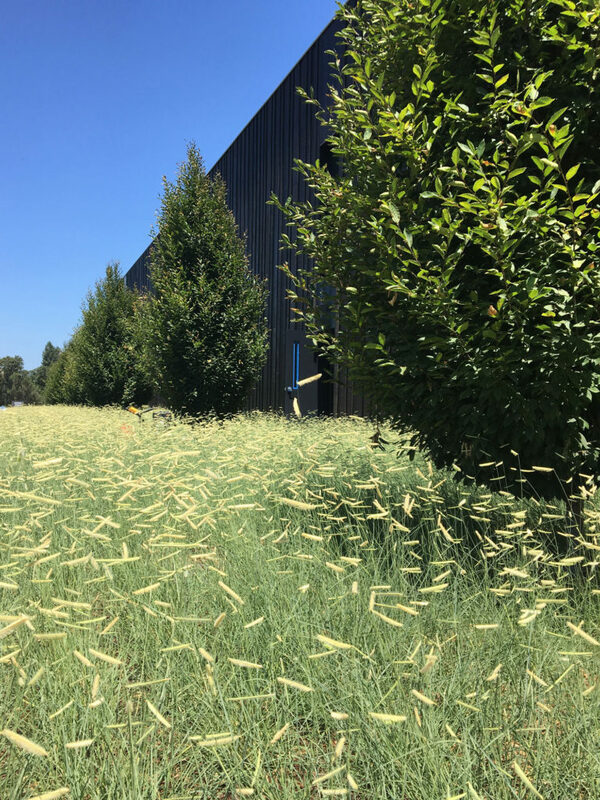 Within the social spaces at the Production Facility and Tasting Room, the design creates outdoor rooms utilizing the natural characteristics of trees, shrubs and grasses to modulate climate and create a welcoming environment for people and nature to co-exist. 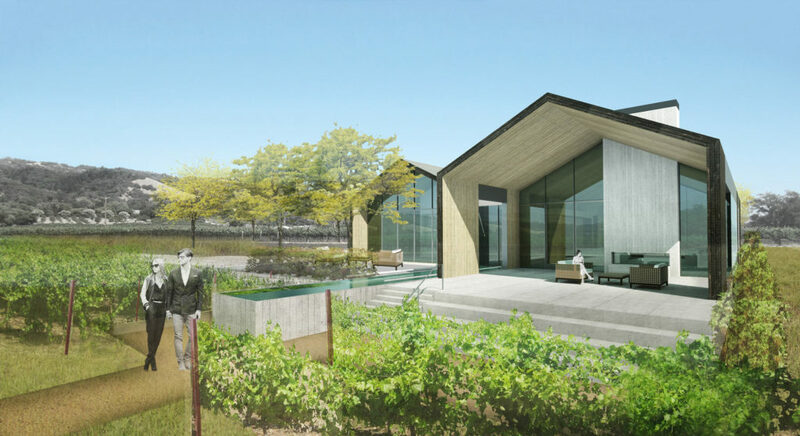 MFLA worked closely with the Silver Oak ownership team and the architects, Sagan Piechota, to achieve the client’s goal in creating the only “zero net water and zero net energy”—and therefore the most environmentally friendly—winery in the country. 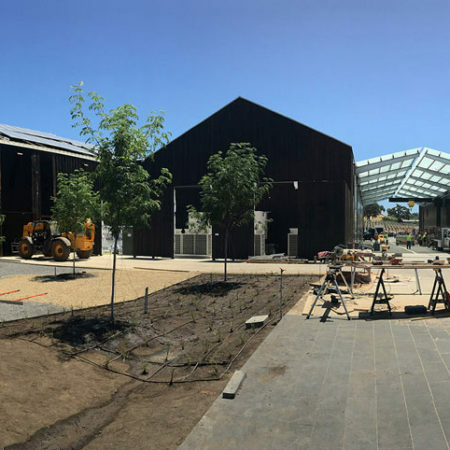 With such a task, the landscape design prioritized the timelessness of the Sonoma landscape to mirror the lasting and sustainable goals of the Silver Oak Winery. 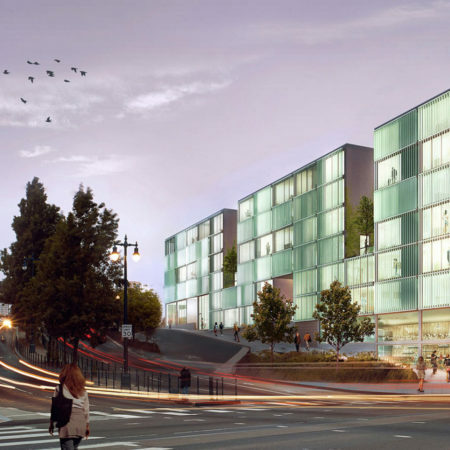 The Hayes Collection consists of four distinct projects with one development team that inserts new mixed-use housing into the remaining interstitial parcels of the San Francisco Hayes Valley neighborhood. 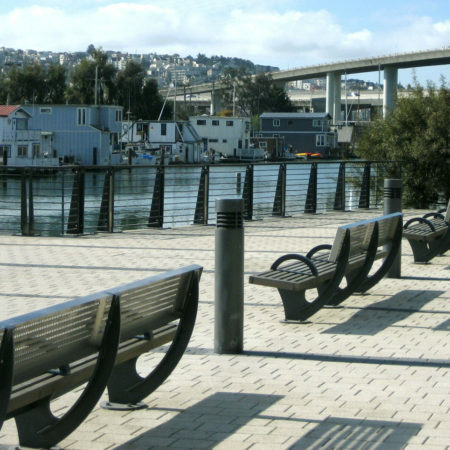 The removal of the City’s central freeway ramps after the Loma Prieta earthquake and the creation of Octavia Boulevard in 2005 provided infill opportunity on typically small and oddly configured parking lot parcels. 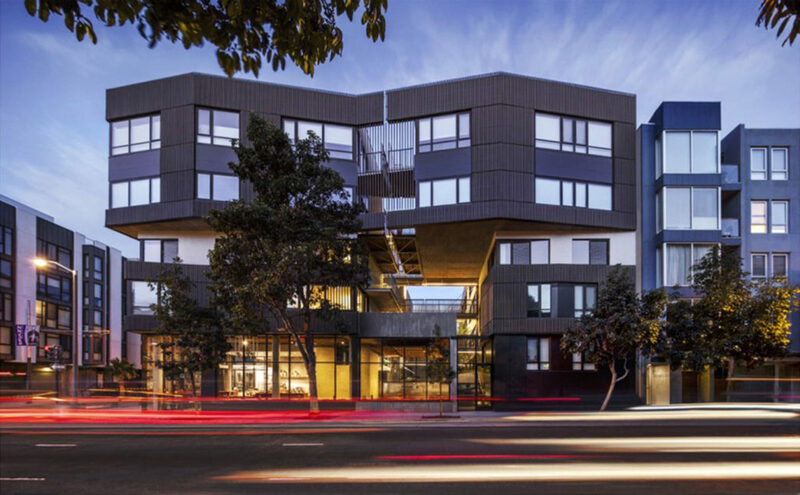 Each are crafted projects with different architectural styles from Saitowitz, Fougeron, Handel, and Edmonds & Lee. 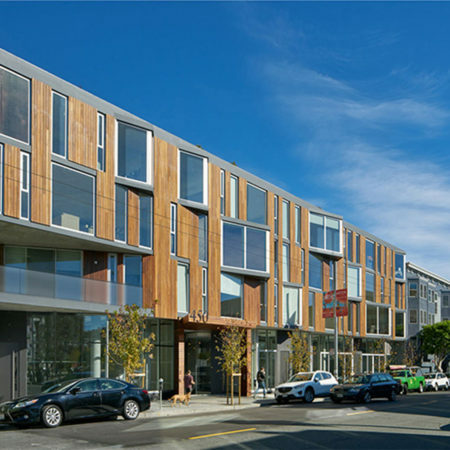 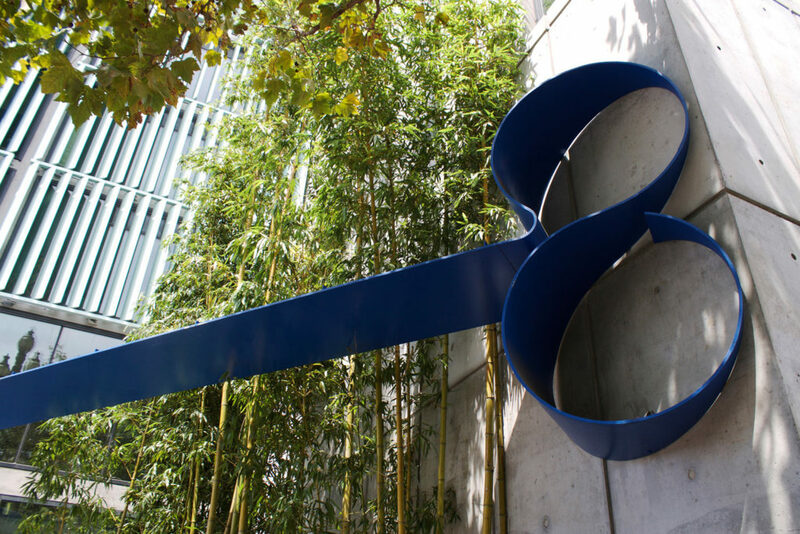 In a popular neighborhood with a scarcity of open space and a tired streetscape, MFLA had the unique opportunity to stitch these projects together developing an identifiable language through streetscape development, courtyards and roof terrace amenities, crafting an ensemble of projects that are unique to Hayes Valley. 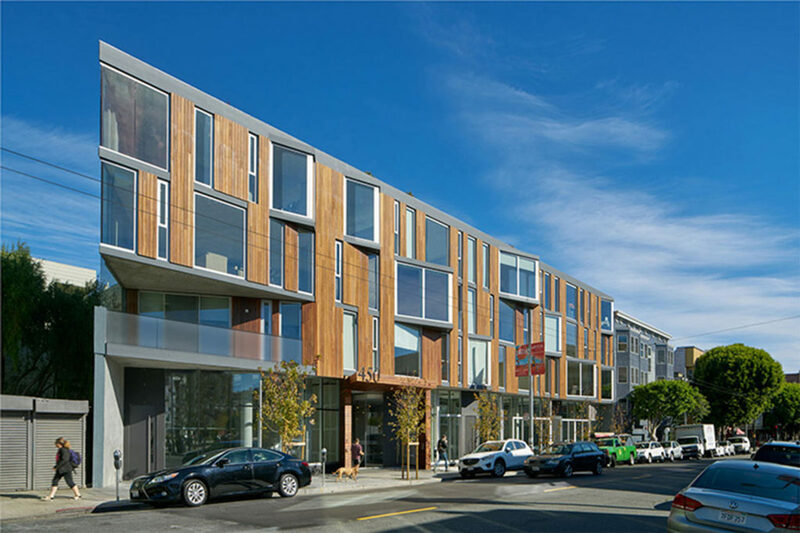 8 OCTAVIA is a gateway building into Hayes Valley. 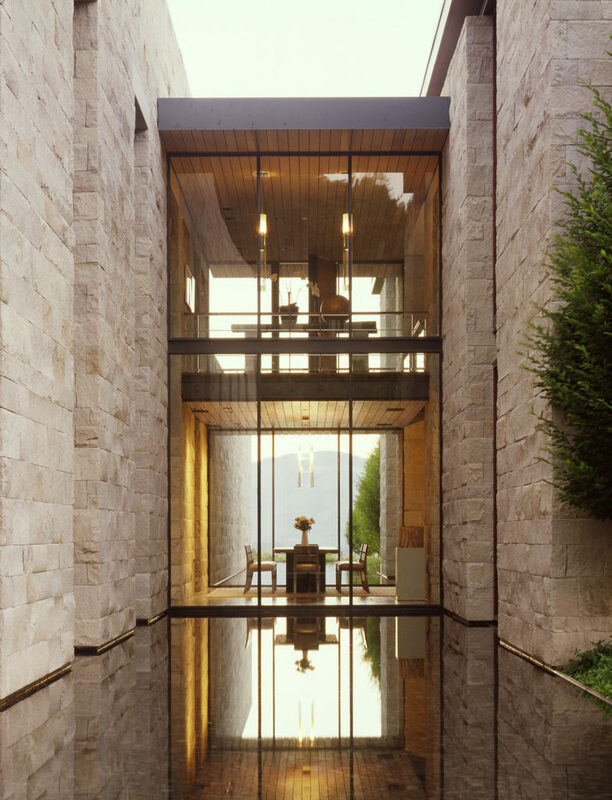 The entry lobby and restaurant are open to our sculpture court, and public and private roof levels were developed for commanding views in all directions. 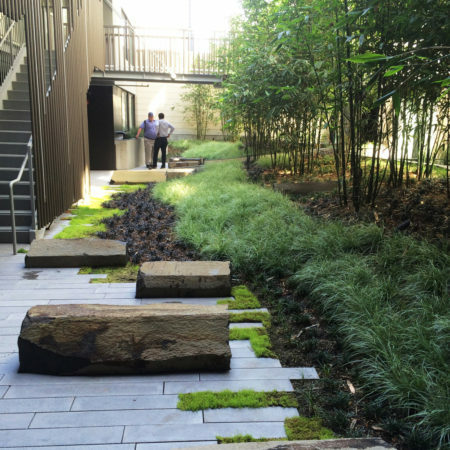 400 GROVE’s bamboo grove and moss garden create a filtered scrim between units. 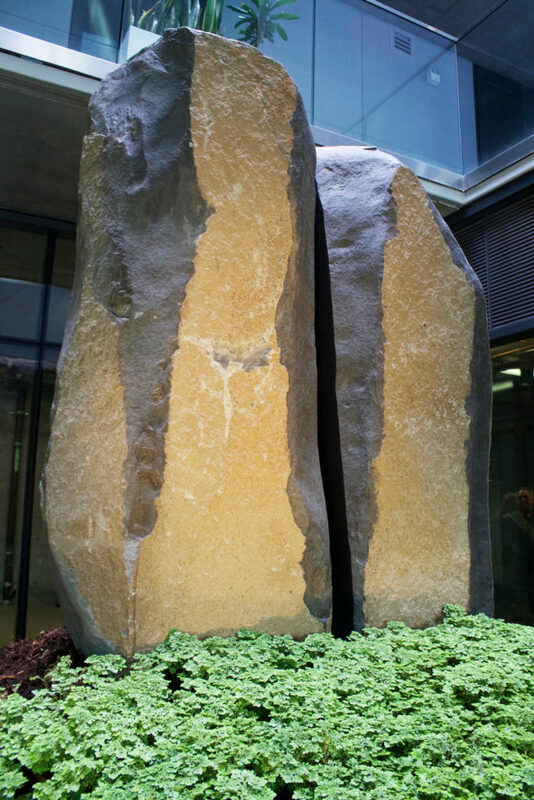 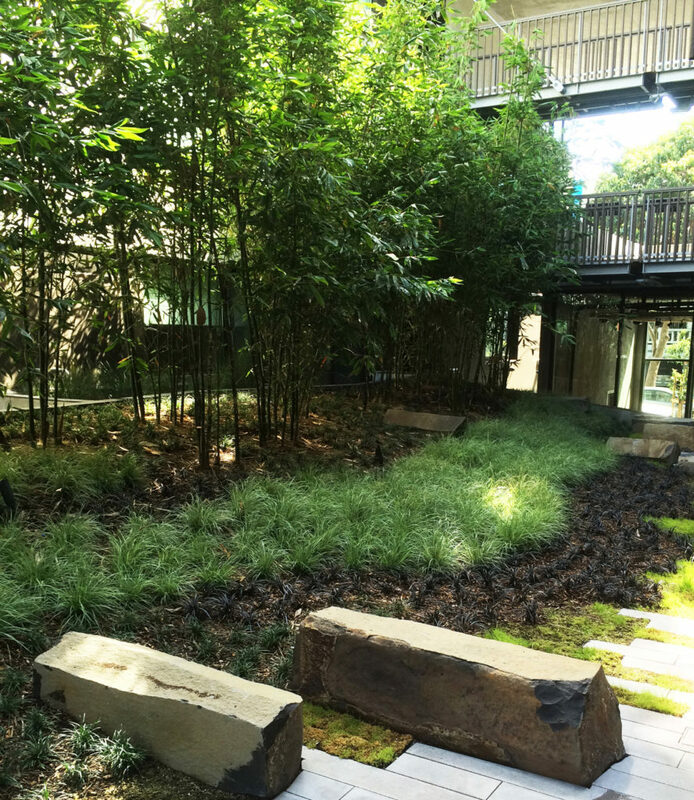 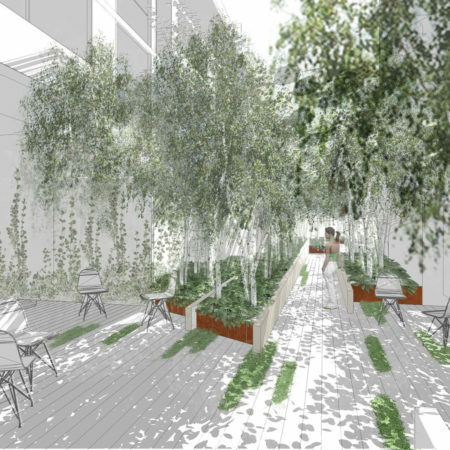 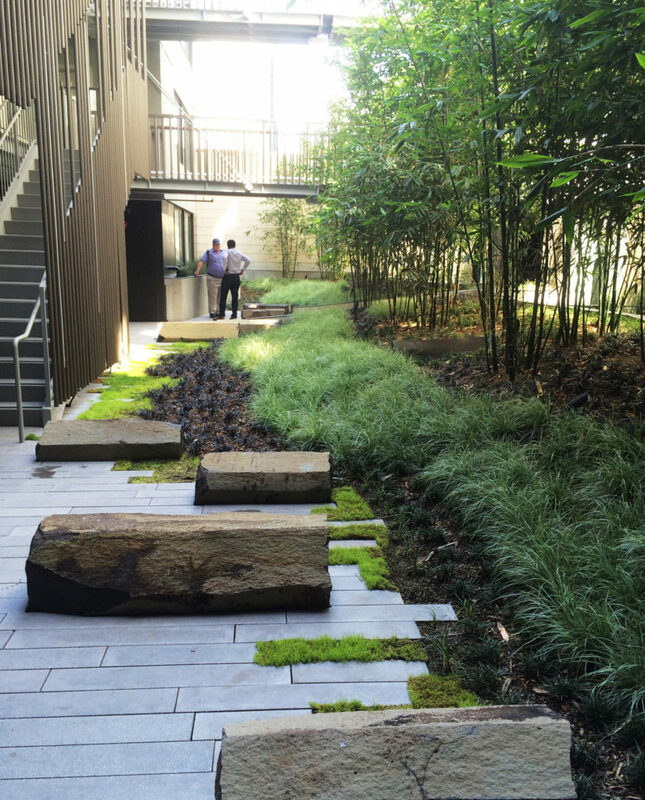 450 HAYES’ internalized courtyard has birch saplings and an understory of ferns functioning as a stormwater basin. 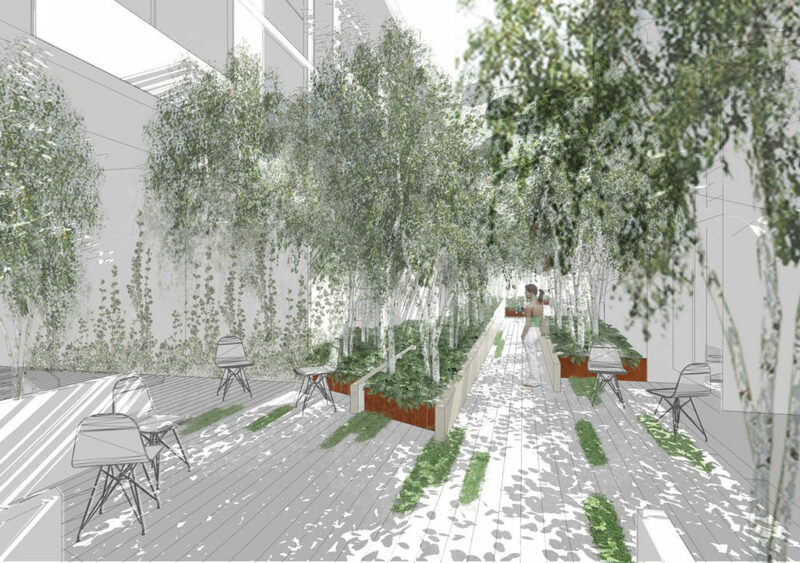 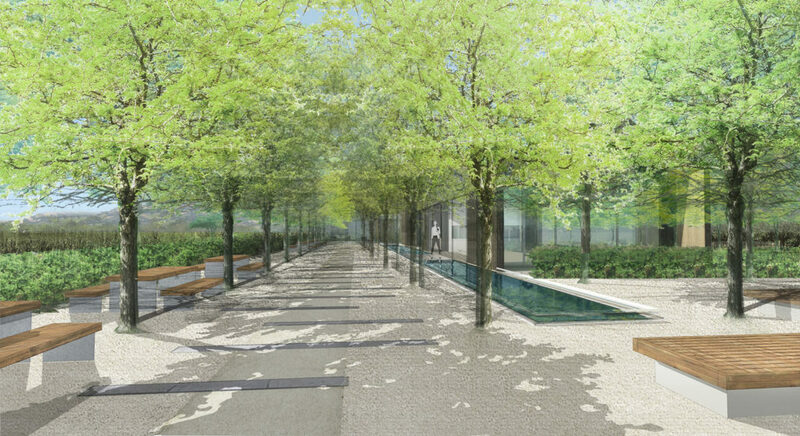 PARCEL T, currently in planning, will re-imagine the streetscape frontage, providing a linear park streetscape. 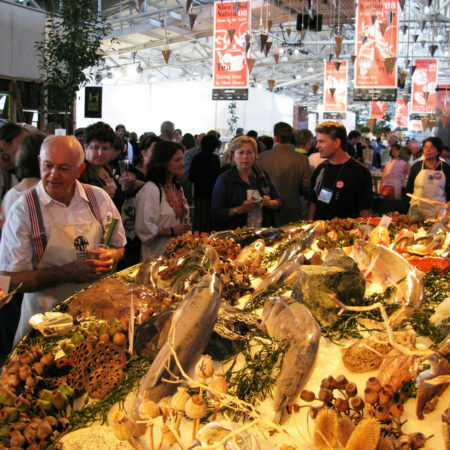 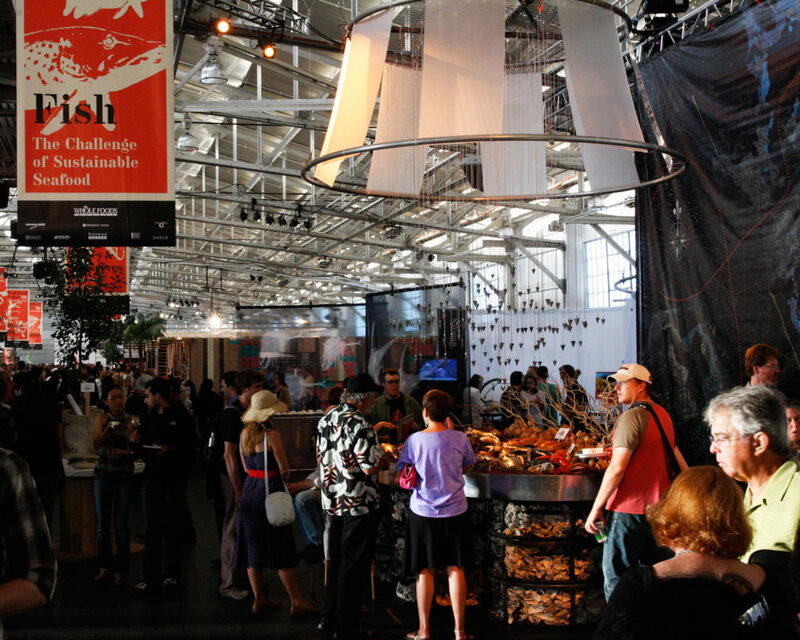 The Fish Pavilion was a temporary exhibit at Slow Food Nation ’08, a three-day inaugural event attended by 85,000 people from across the county. 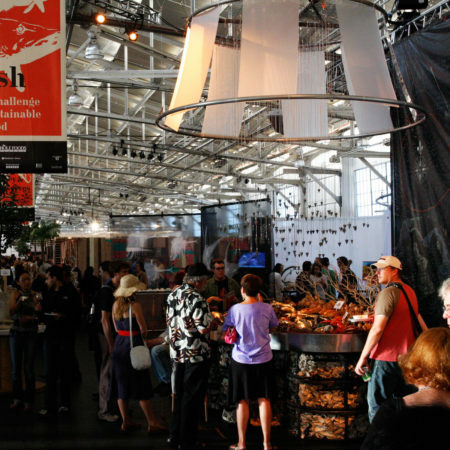 Built largely from repurposed commercial fishing materials and serving 36,000 tastes of local fish prepared by top chefs, this immersive educational environment engaged attendees in the vital relationship between environmental stewardship and food. 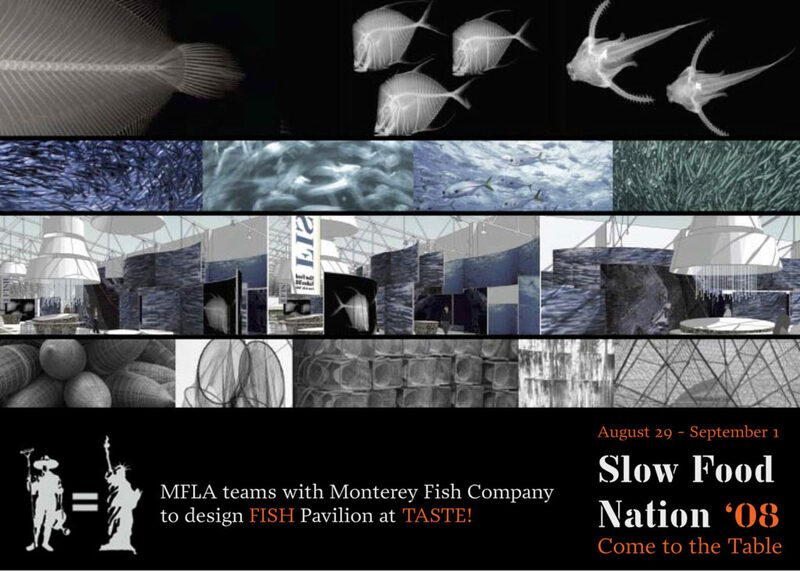 MFLA partnered with Monterey Fish, a unique collaboration between fish monger-food curator and designer-landscape architect, approaching themes of movement, sequence and materiality to engage visitors and evoke the visual and textural bounty of coastal waters. 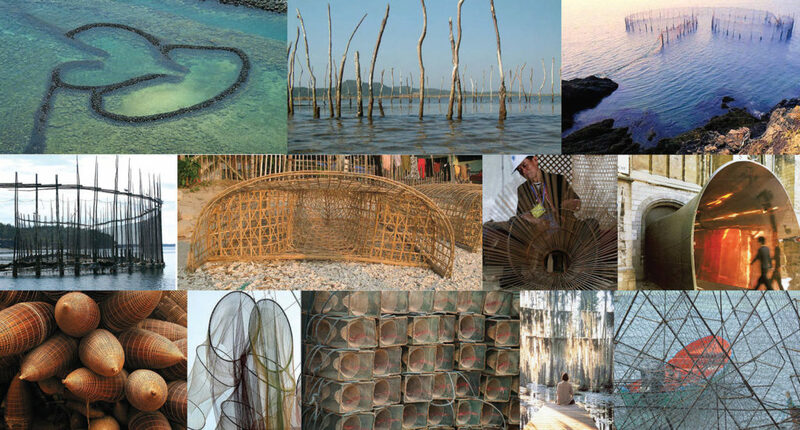 The spatial layout distilled the forms of traditional fish traps with their curving organic shapes and broad entries. 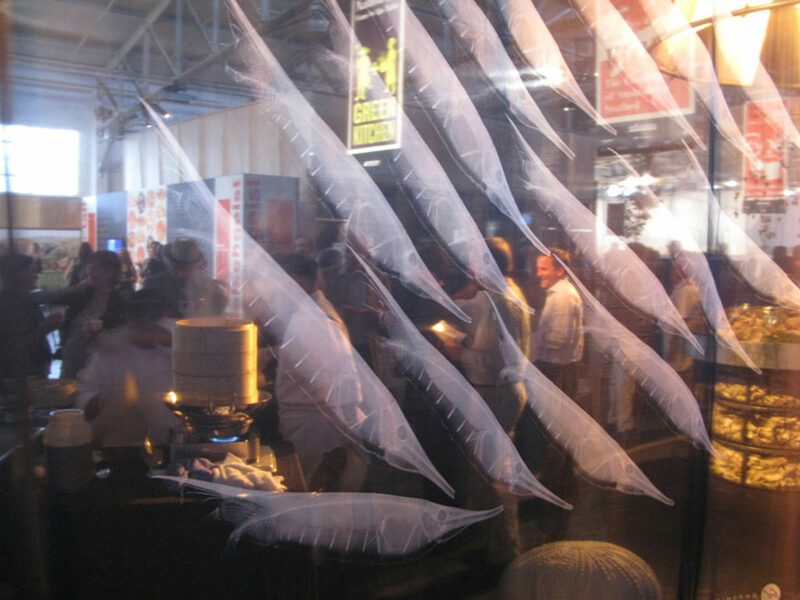 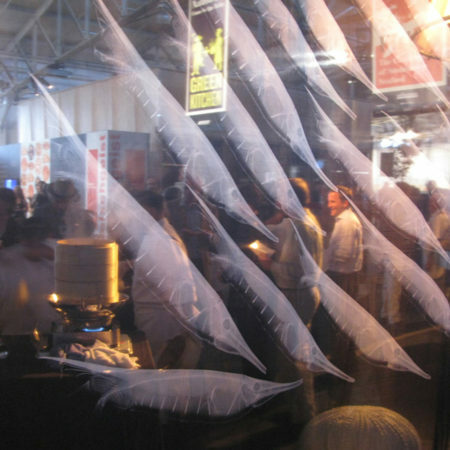 Utilizing translucent fabric scrims, MFLA created a series of undulating rooms as well as a surface for projecting educational imagery of salmon runs and the dramatic black and white Ichthyo x-ray images of sea life from the Smithsonian collection. 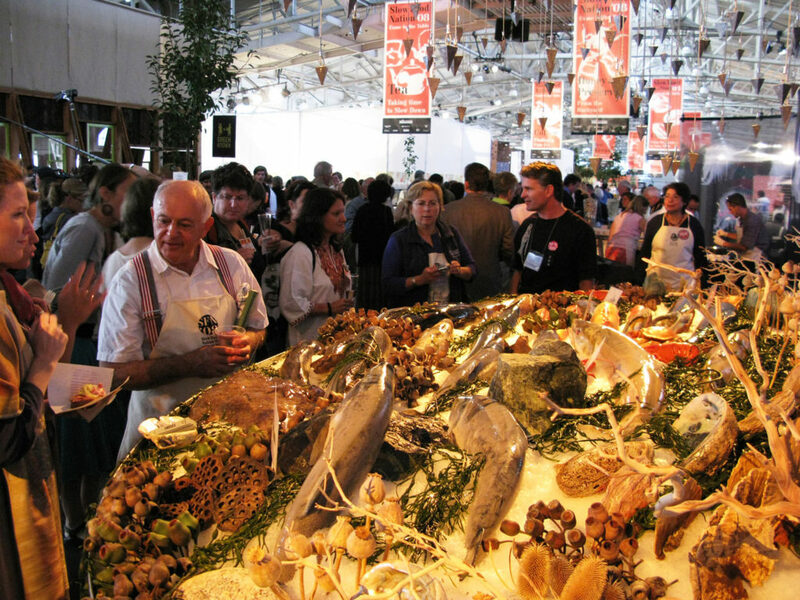 Anchoring the exhibit was the ‘Bella Vista,’ supported by crab trap ‘oyster filled gabbions’ displaying a composition of seafood and defining the exhibit for discourse and dialogue. 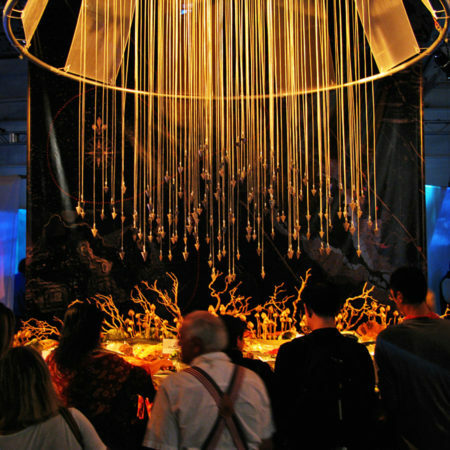 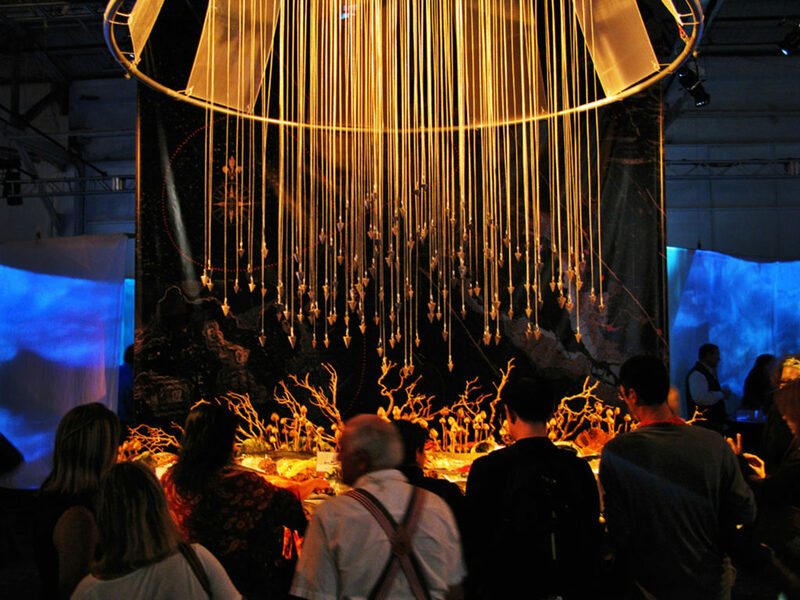 Suspended overhead was a 12’ wide jellyfish-inspired chandelier crafted from translucent panels and fishing weights. 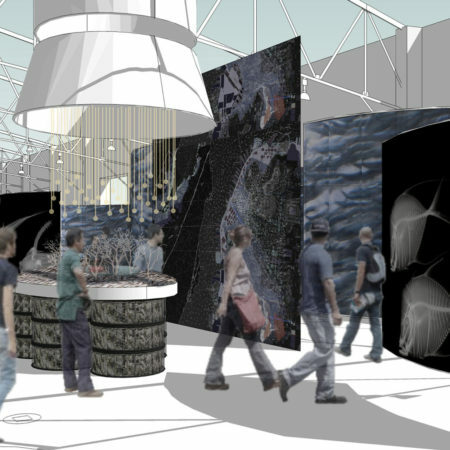 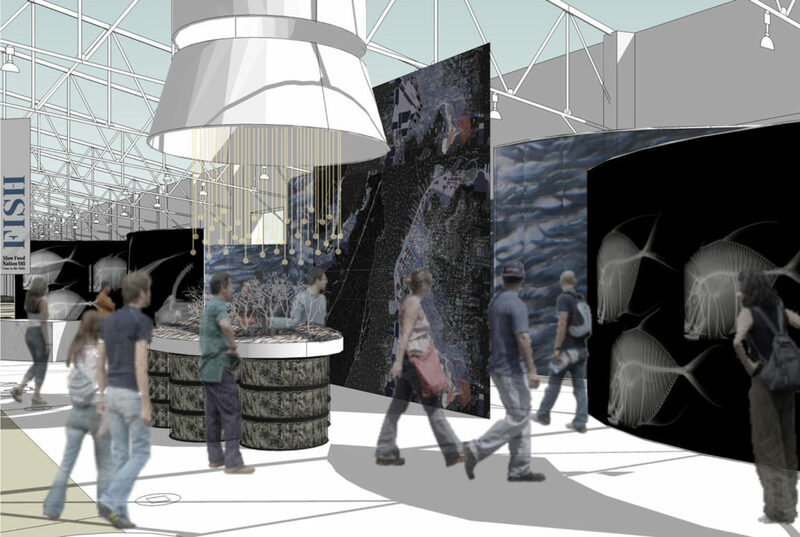 By design, all exhibit material was dispersed to other uses resulting in 100% diversion from the waste stream.